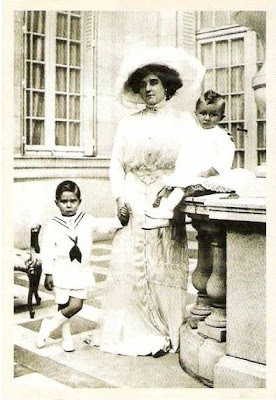 The Cross of Laeken: Blanche Delacroix, "Baroness Vaughan"
Blanche Zélie Josephine Delacroix (1883-1948) was a young Parisian courtesan who became the mistress and, eventually, the morganatic second wife of King Leopold II of the Belgians. She was a woman of the people, dark, handsome in a coarse way, no raving beauty, but lively and charming. Leopold, nearly 50 years her senior, met Blanche, otherwise known as "Caroline", when she was 16 years old, and fell madly in love with her. It seemed to be the first time that the King, infamous for his disastrous marriage and long series of casual affairs, had become deeply attached to a woman. Cold and miserly with his wife and daughters, he lavished endearments, gifts and properties upon the girl. To the great scandal of the Belgians and the court, he eventually titled her, unofficially, "Baroness Vaughan." To Blanche, the King was probably initially merely a conquest beyond her wildest dreams, but, on her side, too, genuine affection appears to have developed. In her memoirs, she lamented that she and Leopold's valet were the only ones to mourn the death of the violently unpopular King in 1909. After the death of Queen Marie-Henriette, in 1902, the King gave his mistress a luxurious villa in Laeken. Strangely down-to-earth, she diligently looked after the books and accounts, presiding over her establishment like a bourgeois housewife. During this period, she bore two sons, Lucien (b. 1906) and Philippe (b. 1907). Although their paternity has never been definitively established, the King eagerly accepted them as his own. For decades, he had been tormented by his lack of a male heir, and now, in the evening of his life, he was overjoyed to have two boys in rapid succession. Abandoning his normally glacial, haughty stance, he doted on the children. At some point, Leopold married Blanche in a secret, religious ceremony. The most widely accepted version is that the wedding took place at Laeken during the King's final illness. At the eleventh hour, Leopold wanted to save his soul by regularizing his union with Blanche and receiving the Last Rites. He was 74, his bride 26. The King left much of his fortune to Blanche, providing for her for the rest of her life. Leopold's daughters, and, indeed, Belgian public opinion, were outraged by this settlement, but could do nothing to prevent it. The young woman departed Belgium in triumph, and began a new life. In 1910, she re-married. Her new husband was Antoine Durrieux, one of her long-standing admirers, who adopted her sons. 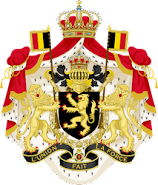 Philippe (unofficially titled "Count of Ravenstein") died in 1914, Lucien ("Duke of Tervueren") in 1984. Today, nothing remains of the notorious Madame Vaughan, once the talk of Belgium, except a few faded photographs...sic transit gloria mundi. Charles d'Ydewalle. Albert and the Belgians: Portrait of a King. 2005. Xavier Paoli. Their Majesties as I Knew Them. 1911. Patrick Weber. Amours royales et princières. 2006. Leopold II didn't deserve to be mourned if he treated this greedy woman better than his wife and daughters. It's downright shameful how he treated them. You are more gracious to this woman than I would be. I haven't read any good accounts of her. She seemed to make a good deal of money out of living an immoral life. Thank you for posting this.. I was editing a wikipedia page, and it was useful in my research. Kudos. Thank you, I am glad it was useful.